The mil (malfunction indicator lamp) is used to indicate vehicle malfunction detections by the ecm. When the ignition switch is turned on, power is supplied to the mil circuit, and the ecm provides the circuit ground which illuminates the mil. The mil operation can be checked visually: when the ignition switch is first turned on, the mil should be illuminated and should then turn off. If the mil remains illuminated or is not illuminated, conduct the following troubleshooting procedure using the intelligent tester. Perform troubleshooting in accordance with the table below. Connect the intelligent tester to the dlc3. Turn the ignition switch on and turn the tester on. 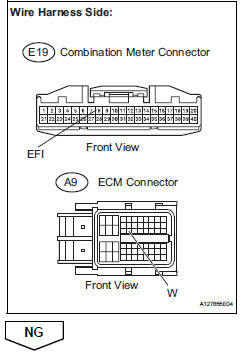 Select the following menu items: diagnosis / enhanced obd ii / dtc info / current codes. Check if any dtcs have been stored. Note down any dtcs. Clear dtcs (see page es-35). Check if the mil goes off. Standard: mil should go off. 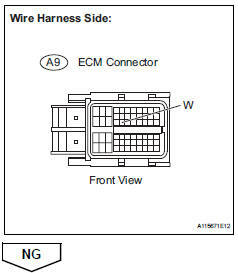 Disconnect the a9 ecm connector. Check that the mil is not illuminated. Ok: mil is not illuminated. Disconnect the e19 combination meter connector. Reconnect the combination meter connector. Check if the mil is illuminated when the ignition switch is turned on. Ok: mil should be illuminated. *: The intelligent tester cannot communicate with the ecm. 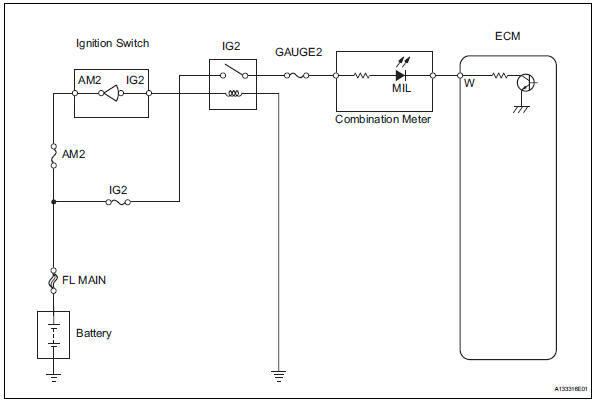 Check the mil circuit (see page me-15).